Now you can send online this Exclusive Gift Of Delicious Food Items and spread warm love to others. 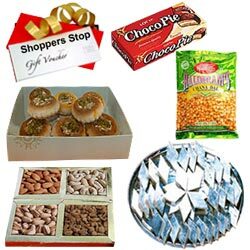 This gift hamper comes with 100 gms Assorted Dry Fruits, 250 gms Haldiram Kaju Katli, 250 gms Haldiram Badam Baked Kalash, 200 gms Haldiram Chana Dal, Chocopie and Rs. 500 Shoppers Stop Gift Voucher.